Google has now banned its infamous brain teaser interview questions. 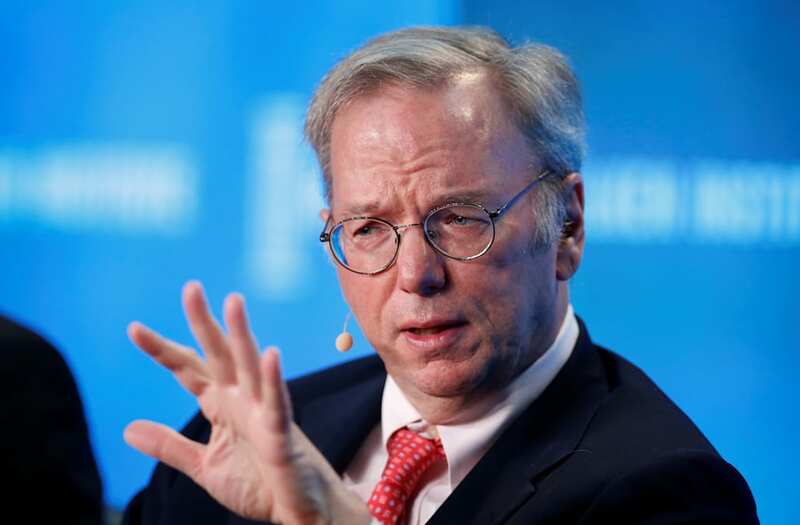 And that's probably a good thing, because if Alphabet executive chairman Eric Schmidt had been asked them when he interviewed all those years ago, he might have been dinged some points for struggling to come up with the answer. You're the captain of a pirate ship and you find a chest of gold. Your crew gets to vote on how the gold is divided up. If fewer than half of the pirates agree with you, you die. How do you recommend apportioning the gold in such a way that you get a good share of the booty but still survive. "Let's do the math...if half die. No, if I die... No, if they don't like me, I die. This is, like, a really bad question. ... It seems to me that if more than half are happy, I survive. I propose, that we give 49% of the pirates stock in internet companies, and 51% get the gold." Despite the kvetching and complaining about the question, he actually did come up with the "correct" answer, which is to give the pirates 51% of the gold and keep the other 49% for himself. However, we'd argue that giving away 51% is still pretty risky depending on how many people in the crew there are. If a large crowd is effectively sharing half the gold while the captain keeps half for himself, that's not exactly booty income equality and can lead to resentment. The crew may then be tempted to elect a captain that promises to make the boat great again. So it says something about Schmidt's psyche that he wanted to double down and secure his life by giving the pirates stock in internet companies, too. In the Valley, it seems anyone who has access to gold has access to stock in internet companies. The life-saving questions really is: which company? Google stock? Probably save your life. Yahoo? Get the plank. How many times a day does a clock's hands overlap? Explain the significance of "dead beef"
Click here for the answers, explanations and more banned interview questions. Body language expert Tonya Reiman, author of "The Power of Body Language," previously told Business Insider that job candidates should make sure they offer the "appropriate amount of eye contact." "If you don't, the interviewer will assume you are either insecure, don't have an appropriate answer for the question being asked, or are being deceptive. Does that mean it's true? No, but perception is everything in a job interview." Reiman said smiling demonstrates confidence, openness, warmth, and energy. This may give the interviewer the impression that you're bored or uninterested in the conversation. Instead, keep your hands on the desk or table, and don't fidget. In their book "Crazy Good Interviewing," John B. Molidor, Ph.D., and Barbara Parus suggest showing your palms during an interview — since the gesture indicates sincerity — or pressing the fingertips of your hands together to form a church steeple. which displays confidence, reports Business Insider's Shana Lebowitz. Reiman previously told Business Insider you should always be aware of your posture. "People don't realize that the job interview begins in the waiting room, but it does. So don't slouch in the chair in the reception area," she advised. "In order to be perceived as confident, you must sit or stand tall, with your neck elongated, ears and shoulders aligned, and chest slightly protruding." This position changes the chemicals in our brain to make us feel stronger and more confident, and it gives the outward appearance of credibility, strength, and vitality, she explained. Playing with your hair, touching your face, or any other kind of fidgeting can be a major distraction for your interviewer. It also demonstrates a lack of power, said Reiman. This gesture will tell the interviewer you're not comfortable or you're closed off. "You should always keep your hands in view when you are talking," Patti Wood, a body language expert and author of "SNAP: Making the Most of First Impressions Body Language and Charisma," previously told Business Insider. "When a listener can't see your hands, they wonder what you are hiding." To look honest and credible, keep your arms uncrossed and show your hands. "When we touch our faces or hair, it is because we need self soothing,"Reiman explained. A weak handshake may tell the interviewer that you're nervous, shy, and that you lack confidence, explains Colin Shaw, CEO of Beyond Philosophy, a customer experience consultancy, in a LinkedIn post. Ideally, your handshake should be firm, but not overbearing. "The secret to a great handshake is palm-to-palm contact," Wood told Business Insider. You want to slide your hand down into the web of theirs, and make palm-to-palm contact. Lock thumbs, and apply an equal amount of pressure. "It's okay to use your hands to illustrate a few important points," writes Lebowitz. "In fact, research suggests that staying too still can give the impression of coldness. "But relying too much on hand gestures can be distracting, according to Molidor and Parus." She says you should remember you're in a job interview, not a theater audition. People tend to show their dominating personality by gripping the interviewer's hand and palming it down, but this tells the interviewer that you need to feel powerful, Reiman explained. "Instead, the handshake should be more natural: thumbs in the upward position and two to three pumps up and down." As the applicant, you should always wait for the interviewer to extend their hand first, she added.